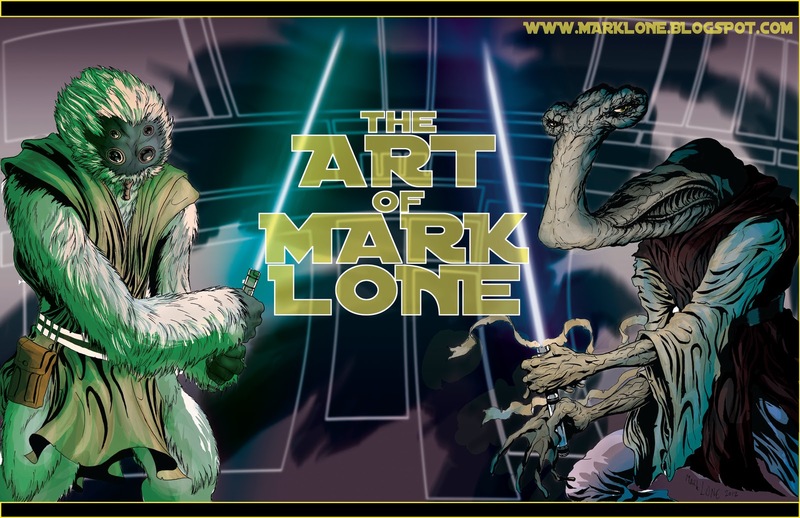 The ART OF MARK LONE...: STAR WARS! Got some exciting stuff around the corner! First of all I will be working with writer Matthew Lavasseur on an epic tale called "A TEAR FOR TEN THOUSAND" which is in the development stages right now, so I will be pretty busy with that as my main project in the coming months, so with that said, Rise of the mutant underground #4 will be delayed just a bit unfortunately. Also in store is a project I will helping my friends Jay Franklin (writer, deafmutepress) and Stefano Cardoselli (artist, heavy metal magazine) called "RED BAND" which we are whipping up some promotional art for our upcoming kickstarter campaign to raise funds to make the project as professional as possible. A few shows coming up: "indie comic night" an event I set up and got a bunch of really great comic artists to show up for happening at the acoustic cafe in eau claire wisconsin jan. 18th. In the meantime, please enjoy this star wars jedi picture I made for practice to get back into the swing of things after the holidays :) HAPPY NEW YEAR EVERYBODY!